After Rosco dropped the axe on their sample gel program, us photographers had to find alternatives. 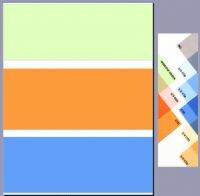 The idea is quite simple, using a transparency sheet and a printer, simply print your favorite gels on the sheet. In the project description there is a PDF with CTB, CTO and Window Green gels – your starters strobist kit. Are the colors 100% balanced, I am not sure, however, it is a quick solution till Rosco comes up with their strobist kit. LINK. 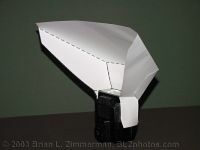 The original stofen is a plastic thingy that turns your speedlight into a bare bulb strobe. If you look into it, the stofen is a simple, yet genius device. It redistributes the directional light that comes from your strobe to all directions. It does so by placing semi transparent plastic cap on top of the strobe. The cool thing is that you can also place semi transparent paper to achieve the same result. DIYP’s version uses wax paper since it is both semi-transparent and relatively holds form. LINK. This is by far, one of the cooler applications to paper that I have ever seen. You can actually print a lens hood to match your lens. I find this useful in two occasions: if you are wondering weather you’d like one hood or another – say petal hood or round hood; or if you need a quick spare. I I’d use thick black foamies rather than paper though. LINK. The original Lumiquest provides a “bigger flash” by creating an instantly attachable surface so the flash can be bounced off of it. Again this application will work best with foamies. Actually two foamies per bouncer – white for the interior, and black for the exterior. This way you’ll get reflective surface on the where the light hits and no light spilling from the back. LINK. 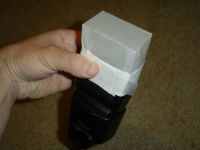 Now that you have your flash gels that you printed, you probably want to attach them to your flash. If you don’t have a speed strap, your next best option is a strip of paper folded in a most sophisticated way. But folding is not enough, you will have to cut the paper. This one makes me thing that foamies shuold rule the world LINK. If you read this site for a while, you are probably familiar with the simple macro studio setup. A while back we also featured an Origami studio. And here is something new about this studio. If you make a small version of it you’ll get quite a strong bench. It can also double as a baby doll bed for your little ones. LINK.